Western blotting(also called protein immunoblotting because an antibody is used to specifically detect its antigen) is a widely accepted analytical technique used to detect specific proteins in the given sample. It uses SDS-polyacrylamide gel electrophoresis(SDS-PAGE) to separate various proteins contained in the given sample(e.g. to separate native proteins by 3-D structure or denatured proteins by the length of the polypeptide). The separated proteins are then transferred or blotted onto a matrix( generally nitrocellulose or PVDF membrane), where they are stained with antibodies(used as a probe) specific to the target protein. By analyzing location and intensity of the specific reaction, expression details of the target proteins in the given cells or tissue homogenate could be obtained. Western blotting could detect target protein which is as low as 1ng due to high resolution of the gel electrophoresis and strong specificity and high sensitivity of the immunoassay. This method is used in the fields of molecular biology, biochemistry, immunogenetics and other molecular biology disciplines. 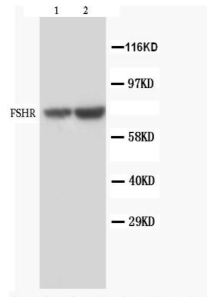 >>Can switching to Boster really save you 99% on Western Blot reagents? Western blotting usually involves two major processes, namely, SDS-polyacrylamide gel electrophoresis and protein blotting and testing. Electrophoresis separation describes a phenomenon that charged particles move towards opposite electrode under the influence of electric field. It is used to separate proteins according to their electrophoretic mobility which depends on charge, molecule size and structure of the proteins. Polyacrylamide gel(PAG) is a three-dimensional mesh networks polymer composed of acrylamide and a cross-linker(methylene bisacrylamide) under the catalyzation of ammonium persulfate. PAG is a versatile supporting matrix due to its stable hydrophily and little adsorption and electroosmosis effect provided by its neutrally charged nature. (It possesses several electrophoretically desirable features that make it a versatile medium. It is a synthetic, thermo-stable, transparent, strong, chemically relatively inert gel, and can be prepared with a wide range of average pore sizes.) In the presence of SDS, electrophoretic mobility is mainly based on molecule weight instead of on charge and size of the proteins. SDS is an anionic detergent which could break hydrogen bond within and between molecules to unfold proteins and break up secondary and tertiary structures as denaturing agent and hydrotropy agent. Strong reducing agents such as mercaptoethanol and Dithiothreitol(DTT) could disrupt disulfide linkages between cysteine residues. SDS and reducing agents are applied to protein sample to linearize proteins and to impart a negative charge to linearized proteins. In most proteins, the binding of SDS to the polypeptide chain imparts an even distribution of charge per unit mass, thereby the intrinsic charges of polypeptides becomes negligible when compared to the negative charges contributed by SDS. This new negative charge is significantly greater than the original charge of that protein. The electrostatic repulsion that is created by binding of SDS causes proteins to unfold into a rod-like shape thereby eliminating differences in shape as a factor for separation in the gel. Minor axis of all rods, the SDS-protein subunit compound are nearly the same, about 1.8nm. And the length of major axis is in proportion to molecular weight of the protein subunit. Thus electrophoretic mobility of the SDS-protein subunit compound is based on molecular weight, eliminating the influence imposed by size and charge. The sample to be analyzed is mixed with SDS. And the mixed samples are subsquently treated by related solution. Heating the samples to at least 60°C further promotes protein denaturation and depolymerization, helping SDS to bind and enabling the rod-shape formation and negative charge adherence. A bromophenol blue dye may be added to the protein solution to allow the experimenter to track the progress of the protein solution through the gel during the electrophoretic run. An appropriate amount of glycerol is added to increase density and accelerate the migration of sample solution. A buffer system with different pH values is applied in gel electrophoresis process. A very widespread discontinuous buffer system is the tris-glycine or "Laemmli" system that stacks at a pH of 6.8 and resolves at a pH of ~8.3-9.0. A drawback of this system is that these pH values may promote disulfide bond formation between cysteine residues in the proteins because the pKa of cysteine ranges from 8-9 and because reducing agent present in the loading buffer doesn't co-migrate with the proteins. Recent advances in buffering technology alleviate this problem by resolving the proteins at a pH well below the pKa of cysteine (e.g., bis-tris, pH 6.5) and include reducing agents (e.g. sodium bisulfite) that move into the gel ahead of the proteins to maintain a reducing environment. An additional benefit of using buffers with lower pH values is that the acrylamide gel is more stable at lower pH values, so the gels can be stored for long periods of time before use. As voltage is applied, the anions (and negatively charged sample molecules) migrate toward the positive electrode (anode) in the lower chamber, the leading ion is Cl¯ ( high mobility and high concentration); glycinate is the trailing ion (low mobility and low concentration). SDS-protein particles do not migrate freely at the border between the Cl¯ of the gel buffer and the Gly¯ of the cathode buffer. Because of the voltage drop between the Cl- and Glycine-buffers, proteins are compressed (stacked) into micrometer thin layer-stacking gel layer. In resolving gel layer, proteins with more negative charges per unit migrate faster than those with less negative charges per unit. That is, proteins with small molecular weight migrate faster than proteins with large molecular weight. The boundary moves through a pore gradient and the protein stack gradually disperses due to a frictional resistance increase of the gel matrix. Stacking and unstacking occurs continuously in the gradient gel, for every protein at a different position. Polyacrylamide gel electrophoresis (PAGE) is used for separating proteins ranging in size from 5 to 2,000 kDa due to the uniform pore size provided by the polyacrylamide gel. Pore size is controlled by controlling the concentrations of acrylamide and bis-acrylamide powder used in creating a gel. Typically resolving gels are made in 5%, 8%, 10%, 12% or 15%. Stacking gel (5%) is poured on top of the resolving gel and a gel comb (which forms the wells and defines the lanes where proteins, sample buffer and ladders will be placed) is inserted. The percentage chosen depends on the size of the protein that one wishes to identify or probe in the sample. The smaller the known weight, the higher the percentage that should be used. Changes on the buffer system of the gel can help to further resolve proteins of very small sizes. Five steps are involved in western blotting and detection assay, namely, transfer, blocking, primary antibody incubation, secondary antibody incubation and protein detection and analysis. Proteins are moved from within the gel onto a membrane made of nitrocellulose(NC) or polyvinylidene difluoride(PVDF). Without pre-activation, proteins combine with nitrocellulose membrane based on hydrophobic interaction, thereby having slight effect on protein activities. Besides, nitrocellulose membrane produces little non-specific staining. It is cheap and ease to use. However, it is easy to erase small molecular proteins while washing. It is fragile and has poor toughness. With high affinity, the PVDF membrane needs to be sunk in methanol before use to activate positive charge groups on the membrane, promoting combination with negative charged proteins. Specific NC membrane with different pores should be applied according to the molecular weight of transferred proteins due to the smaller the pore of membrane the tighter the combination between membrane and small molecular weight proteins. NC membranes of 0.45 µm and of 0.2 µm are used most. The size of 0.45 µm should be applied for proteins with molecular weight over 20KD while the size of 0.2 µm will be chosen for those below 20KD. PVDF membrane is best for the detection of small molecular weight proteins due to its higher sensitivity, resolution as well as affinity than normal membrane. 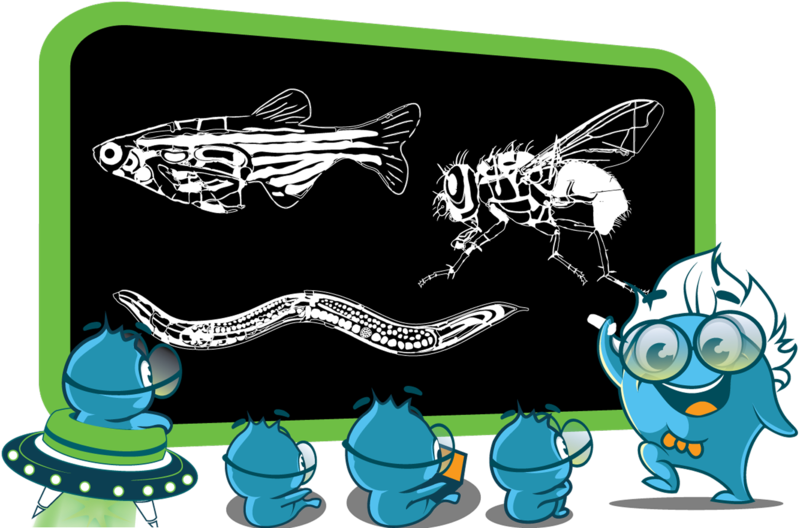 Transfer methods that are used most for proteins are semi-dry transfer and wet transfer. Semi-dry transfer describes the method that Gel-Membrane-Filter sandwich is placed between filters loaded with transfer buffer. The transfer process is based on current conduction produced by the transfer buffer. Semi-dry transfer takes little time with high efficiency as electric current works directly on membrane and gel. While applying wet transfer, the Gel-Membrane-Filter sandwich is placed in the transfer tank, suspending in transfer buffer vertically. Proteins transfer from the gel to the membrane under the control of high intensity electric field produced by electrode plate paralleled to the sandwich. While prolonging time to an appropriate extend, proteins could be transferred more effectively. Proteins within several gels could be transferred. 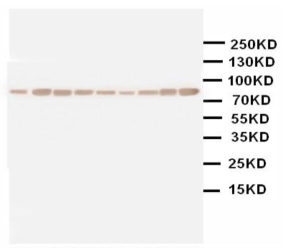 In a western blot, it is important to block the unreacted sites on the membrane to reduce the amount of nonspecific binding of proteins during subsequent steps in the assay using inert protein or nonionic detergent. Blocking buffers should block all unreacted sites. And Blocking buffers should not replace target protein on the membrane, not bind epitope on the target protein and not cross react with antibody or detection reagents. The most typical blockers are BSA, nonfat dry milk, casein, gelatin and Tween-20. TBS and/or PBS are the most commonly used buffers. Inertia protein BSA, nonfat dry milk, casein, gelatin or nonionic detergent Tween-20 reduce nonspecific binding by blocking unreacted sites. Retaining protein structure, Tween-20 can reduce breakup to original interaction among proteins while is used for protein emulsification. Avoid using nonfat dry milk as a blocking reagent for blots with biotin conjugated antibody because milk contains variable amounts of glycoprotein and biotin. BSA is appropriate for blots with phosphorylated protein as target. Phosphatase contained in nonfat dry milk leads to dephosphorylation of phosphorylated protein on the membrane while phosphoryltion specific antibody is used to identify phosphorylated protein. And nonfat dry milk is improper for blots which rely on alkaline phosphatase system. Avoid adding NaN3 into blocking reagent for blots that base on HRP system because NaN3 is enabled to inactivate HRP. 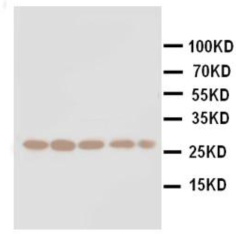 Casein is recommended for blots with alkaline phosphatase conjugated secondary antibody. TBS buffer instead of PBS buffer should be chosen because PBS interferes alkaline phosphatase. After blocking, primary antibody specific to target protein is incubated with the membrane. And the primary antibody binds to target protein on the membrane. In western blot, primary antibody should be validated before use. The choice of a primary antibody depends on the antigen to be detected. 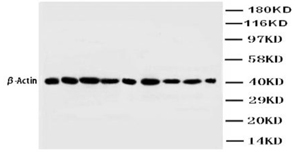 Both polyclonal and monoclonal antibodies work well for western blot. Monoclonal antibodies recognize single specific antigenic epitope. Thus, they have higher specificity resulting in lower background. Blot results will be influenced if the target epitope is destroyed. Polyclonal antibodies recognize more epitopes and they often have higher affinity. Blot results will be stable even though a few epitopes are destroyed. The most popular secondary antibodies are anti-mouse and anti-rabbit immune globulin since the host species for primary antibodies are mainly mouse and rabbit. Goat is used widely to raise anti-mouse and anti-rabbit polyclonal antibodies. Thus, goat anti-mouse and goat anti-rabbit immune globulin are the most commonly used secondary antibodies.The choice of secondary antibody depends upon the species of animal in which the primary antibody was raised. For example, if the primary antibody is a mouse monoclonal antibody, the secondary antibody must be an anti-mouse antibody. If the primary antibody is a rabbit polyclonal antibody, the secondary antibody must be an anti-rabbit antibody. A substrate reacts with the enzyme that is bound to the secondary antibody to generate colored substance, namely, visible protein bands. The target protein levels in cells or tissues are evaluated though densitometry and location of the visible protein bands. Alkaline phosphatase (AP) and horseradish peroxidase (HRP) are the two enzymes that are used extensively. Functioned by Alkaline phosphatase (AP) catalyzation, a colorless substrate BCIP will be converted to a blue product. In the presence of H2O2, 3-amino-9- ethyl carbazole and 4-chlorine naphthol will be oxidized into brown substance and blue product respectively under the catalyzation of HRP. Enhanced chemiluminescence is another method that employs HPR detection. Using HRP as the enzyme label, luminescent substance luminol will be oxidized by H2O2 and will luminesce. Moreover, enhancers in this substrate will enable a 1000-fold increase in light intensity. HRP will be detected when the blot is sensitized on photographic film. Proper control design is essential to western blot. It will guarantee accurate and specific test result by identifying various problems quickly and precisely. Positive control: A lysate from a cell line or tissue sample known to express the protein you are detecting. Positive control is designed to verify working efficiency of the antibodies. Negative control: A lysate from a cell line or tissue sample known not to express the protein you are detecting. Negative control is to check antibody specificity. Nonspecific binding and false positive result will be identified. Secondary antibody control(No primary antibody control): The primary antibody is not added to the membrane. Only secondary antibody is added. This is to check secondary antibody specificity. Nonspecific binding and false positive result caused by secondary antibody will be indicated. Blank control: Both primary and secondary antibody are not added to membrane. This is to check membrane nature and blocking effect. Loading control: Loading control is used to check sample quality and the performance of secondary antibody system. Loading controls are antibodies to "house-keeping proteins", or proteins that are expressed at equivalent levels in almost all tissues and cells. Loading controls are required to check that the lanes in your gel have been evenly loaded with sample, especially when a comparison must be made between the expression levels of a protein in different samples. They are also useful to check for even transfer from the gel to the membrane across the whole gel. Where even loading or transfer have not occurred, the loading control bands can be used to quantify the protein amounts in each lane. For publication-quality work, use of a loading control is absolutely essential. Preparation of proteins from cell culture. Culture cells in tube until the density is up to 80%. Digest cells with 0.05% trypsin(AR1007) or scrape adherent cells off the tube using a cold plastic cell scraper. Wash cells with pre-cooling PBS(AR0030) for two times, centrifugate at 3000rpm for 2-3 minutes, and remove supernatants. Then gently transfer the cell precipitation into a pre-cooled tube. Add mammal cell protein extraction reagent(AR0103) which is 5-7 times the volume of the precipitation into the tube, blow and beat repeatedly. Using ultrasonic processor to break up if the solution is murk. Ultrasonic processes for two seconds, and pauses for two seconds. The power is 100-120 watt. And turn off the power when the murk solution becoms clear. Then lysate the solution on ice for 4-5 hours. Ultrasonic processes the solution again. Centrifugate at 10000rpm for 10 minutes. Discard lipid on the top and lower cell debris, and take out protein solution in the middle. Mix the protein solution with Boster SDS-PAGE loading buffer 2X(AR0103) in the same volume or with SDS-PAGE loading buffer 5X(AR1112) in volume ratio of 4:1 evenly. And then denature the solution in 100? water bath for 5 minutes. (The solution could be used immediately or be aliquotted for store. At -20°C for several months, and at 4°C for 1-2 weeks. Preparation of proteins from tissue. Place surgically resected tissues in pre-cooling normal saline immediately. Wash away blood on the tissue. Chop the tissue into several small pieces(0.1-1g) after weighting. Add Boster enzyme inhibitor cocktail prior to homogenate. And Add 10ml mammal tissue protein extraction reagent(AR0101) per 1g of tissue. Grind the tissue until fully homogenized. Lysate tissue homogenate on ice for 4-5 hours after treated by laultrasonic processor. Centrifugate at 10000rpm for 10 minutes and take out protein solution in the middle. 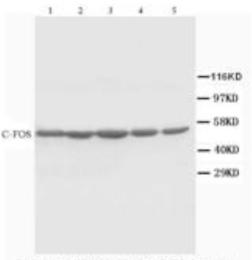 Mix the protein solution with Boster SDS-PAGE loading buffer 2X(AR0103) in the same volume or with SDS-PAGE loading buffer 5X(AR1112) in volume ratio of 4:1 evenly. And then denature the solution in 100 water bath for 5 minutes. After protein sample collection, concentration of proteins should be quantified to ensure equivalent loading amount of each protein. The most commonly used assay kits are boster BCA protein assay kit(AR0146), micro BCA protein assay kit(AR1110) and Commassie plus protein assay kit(AR0145) respectively. Commassie plus protein assay is ease to carry out and to consume less sample. However, different proteins perform with great variety and poor standard curve linearity will be generated. PH value may change under the function of a variety of elements such as, high concentration of Tris, EDTA, urea, glycerol, sucrose, acetone, ammonium sulfate and detergent. And this will subsequently influence color development and interfere protein quantification. BCA protein assay is valued by its stronger stability, higher sensitivity(, higher flexibility. And colored complex formed is more stable with little interfering substance. BCA protein assay has an obvious advantage over commassie plus protein assay, that is, not influenced by detergent. Prepare resolving gel in proportion, blend solution gently to avoid involving too much oxygen. Pour gel solution into two-layer glass pane in gel apparatus slowly. Add a sheet of water to prevent inhalation of oxygen. Placing horizontally, incubate at 37°C for 60 minutes till gel solution is fully polymerized and concreted. Prepare stacking gel in proportion, blend solution gently. Absorb water on concreted resolving gel with filter. Pour stacking gel solution into two-layer glass pane in gel apparatus slowly. Insert comb into the gel carefully (bubble is prohibited between comb tooth. Incubate at 37°C for 60 minutes till gel solution is fully polymerized and concreted and take out the comb gently. Note: Boster SDS-PAGE gel preparation kit(AR0138) is recommended for preparation of gel. Add Boster loading buffer into electrophoresis chamber to a level above sample loading well between two-layer glass pane. Ensure bottom of the gel is immersed in the loading buffer. Liquid level inside the two-layer glass pane is higher than outside level. And then load samples which include treated sample, tissue and cell sample protein for positive control, recombinant protein for positive control and Marker in wells. Load 30-50ug protein to each well and the total loading volume is less than 30ul. Note: the time should be short as much as possible to prevent diffusion of samples. 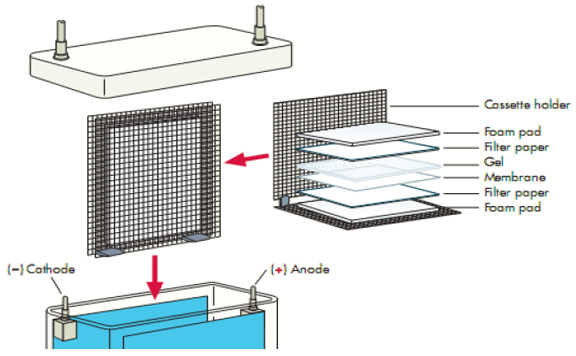 After loading samples, place anode and cathode of electrophoresis chamber cap appropriately. And electrophoresis is carried out under proper voltage. In discontinuous system, voltage for stacking gel(70-80V) is lower than voltage for resolving gel(90-110V) to ensure that proteins are concentrated on the same level before running into resolving gel. Run the gel, and when bromophenol blue dye molecule reaches the bottom of the gel, the power is turned off. This process usually takes 2-3 hours. After electrophoresis, Boster commassie blue staining solution(AR0140), commassie blue fast staining solution(AR0107) and protein silver staining reagents(AR0171) are applied for Gel staining. This is to check if electrophoresis works. Stained gel can not be involved in subsequent membrane transfer procedure. Take out gel and immerse the gel in Boster transfer buffer(AR1149) for 15-30 minutes. Note: Sponge, filter paper and NC membrane should be immersed in transfer buffer thoroughly. Add transfer buffer to the top of electrotransfer tank and insert electric transfer clip in it. Place the tank at -20?. Membrane should be closest to the anode. Negative charged amino acid and protein will migrate towards the anode. Constant current of 150-300mA is usually applicable. Transfer time depends on gel concentration. Membrane staning is recommended to check transfer efficiency. Place NC membrane in Boster imprinted membrane fast reversible protein staining reagent(AR0142) for 5-10 minutes and visible red band will appear. The membrane may be distained completely by repeated washing in wash buffer. Rinse blotting membrane: rinse blotting membrane three times using Boster wash buffer at room temperature for 10 minutes. After rinsing, immerse the blotting membrane in Boster blocking buffer. Incubate for 1.5-2 hours at 4°C under agitation. After being blocked, the membrane is incubated with a primary antibody witch binds to the target protein, and then incubated with enzyme conjugated secondary antibody(HRP conjugated antibody and AP conjugated secondary antibody). 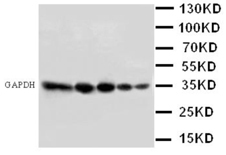 Dilute primary antibody in Boster antibody dilution buffer(AR1017). Incubate the primary antibody and the membrane at 4°C overnight. Wash the membrane with wash buffer for three times, about ten minutes each time . Dilute secondary antibody in Boster antibody dilution buffer(AR1017). Incubate the secondary antibody and the membrane at 4°C for two hours. Wash the membrane for 3-6 times, about ten minutes each time. 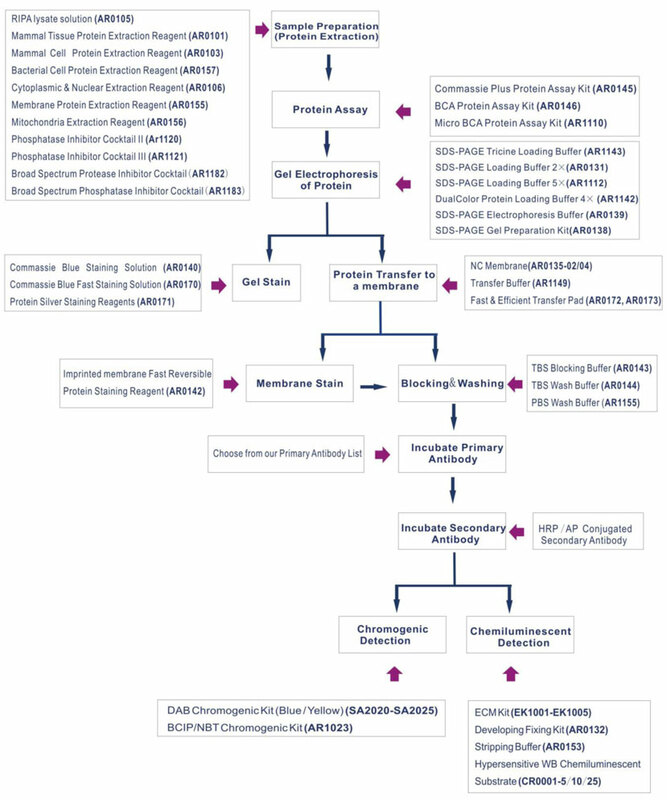 The choice of western blot antibody detection methods depends on specific substances that are labeled or bond to the secondary antibody. ECL chemiluminiscent detection system and DAB chromogenic detection system are typically used in western blotting. 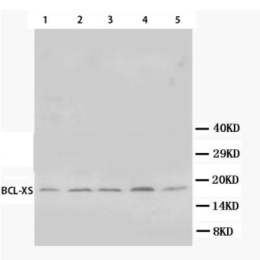 Boster ECL chemiluminescent system depends on incubation of the western blot with a substrate that will luminesce when exposed to HRP on the secondary antibody. The light is then detected and captured by photographic film. ECL chemiluminiscent solution: Add 1ml water to 50ul color reagent A and 50ul color reagent color reagent B from Boster hypersenstive WB chemiluminescent substrate(concentrated), and mix well. Or add the same amount of color reagent A and color reagent B from and mix well. Cover the blotting membrane with color reagent solution. Exposure: record test result using autoradiography film or CHEMIDOC in darkroom. Using autoradiography film, exposure time for the specific antigen depends on developing effect ranging from seconds to minutes. Using Boster developing and fixing kit(AR0132), wash the film in developing solution. Stop washing when the band appear. And then risen the film in fixative. Note: WB Strippping Buffer(AR0153) is recommended to remove primary and secondary antibodies on the membrane if proteins on the membrane needs to be reused. Boster DAB chromogenic reagent: Add 1 ml water, a drop of reagent A, reagent B, and reagent C. Mix well.